You can import external data into Streak through Google Sheets using our free Importer add-on. Before importing your data into Streak, you will first want to consider how you would like your data to be represented in your pipeline after the import. You will want to take this opportunity to customize your pipeline to accommodate your external data before running an import. Streak requires you have a Name column in your pipeline, but you can add as many custom columns to your pipeline as you need. This column is the anchor for all Streak box data. A best practice is to use a unique name for each Box. If your Google Sheet has columns laid out with headers already, we recommend creating columns in your pipeline to match that data. For example, if your Sheet has a location or region column, you can add a new free form column to your pipeline and title it Region. Be sure to consider the different column types to find the best fit for your data, too. You may need to add a Date column instead of a Free form column, for example, depending on the data you're about to import. Before importing, you'll want to make sure the data you're importing is clean and ready. If you're importing a list of contacts into Streak, a good example of clean and ready data would be separate columns for: email addresses, first names, last names, and the company names. In column B we have the box name: Mari Provost, Neal Ismail, Sandy Li, and Laura Logan. Because contacts in Streak require first and last name, column C and D use formulas in Google Sheets to break the information from column B into first and last names. After you have structured your pipeline in Streak and your data in Google Sheets, you're ready to import. 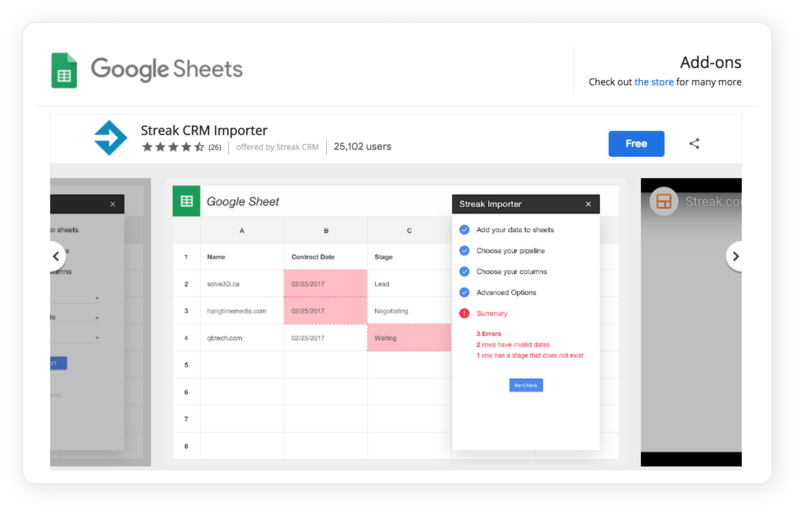 The Streak Importer Add-on for Google Sheets can be installed for free directly from the Chrome Web Store by clicking the Install button. After the add-on has been installed, the Streak CRM Importer tool can be found in the Add-ons dropdown menu of your Google Sheets. From the Add-ons dropdown menu in your Google Sheet, select Start Importing and Streak will guide you through the required steps. Add your data to Sheets – If your sheet already has the data you need, you can continue to the next step. Otherwise, be sure to add the data you're looking to import into the sheet! Choose your pipeline – Choose a pipeline you would like to import into. Choose your box columns – Map your pipeline columns to your Google Sheets Columns. You cannot use a column for more than one field in Streak. If you don't want to edit your Google Sheet's column names, make a copy of the original Sheet, then change the column names, and import from the copy. Choose Your Contact Columns – Streak can create contacts from your sheet and automatically link them to the boxes created during import. If you're not importing contacts, you can also skip this step. Choose Your Organization Columns –Streak can also create Organizations during import. Map your Organization fields to your Google Sheets Columns or select to skip this step. Confirm the Advanced Importing Options such as Ignore header row or Create missing field options. If you are importing data into an existing Dropdown or Tag column in your pipeline, selecting the "Create missing field options" box will automatically create Dropdown/Tag choices for your column if they do not already exist. After confirming, you'll get a Summary of the import with any errors highlighted and the number of boxes to be created on import (up to 5,000 boxes can be created per import). If everything looks ready to go, click Start Import. When the import is complete, you can review the data in your pipeline.